Tired of the same old meal options when celebrating with friends? Do you want to your next gathering to ‘cook’? VictorsFood Cooking Parties are an exciting experience. We guide you and a group of work mates, family or friends to make a fabulous meal while you party together. 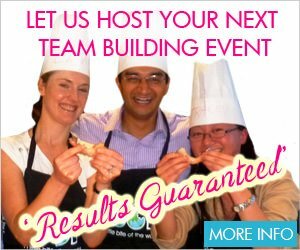 On a budget and looking for a fun Team Cooking Party? Our Flash Feast offering is only $119pp*. We also have a Christmas Flash Feast perfect for your end of year celebrations. Turn your ‘catering requirement’ into dynamic, engaging entertainment with Interactive Catering cooking events.